In a case of advertising working like a charm, (having a strong product to back up the bluster doesn’t hurt either,) Nike hit a grand slam with the, Just Do It, slogan. (I’m personally a big fan of the swoosh, been my exclusive brand of sneaks for a long time.) No denying, it’s one of the most recognized and effective taglines of the 20th Century. Universally understood, it can be applied to countless objectives. Don’t know about you, but I’ve latched onto the words for inspiration. I’m suggesting we all adopt the mindset. Stick with me. How many calls for dialogue do we have going right now? Off the dismayingly long list, the root cause of the recent brutal executions in South Carolina is certainly one of the most pressing, flag or no flag. Jane Goodall has a quote floating around out there on the net that speaks to what I’m talking about, “Change happens by listening and then starting a dialogue with the people who are doing something you don't believe is right.” Contemplating the recent climate of hatred that's contaminated us, we might consider walking that walk, instead of just continually talking about doing something. But that would take the ability to listen first, and I wonder if that art is dead. Is there anyone else whose feeling at a loss for the world? Could we be more angry and hateful? What have we degraded to when a 21 year old feels justified in walking into a church full of people, studying scripture no less, and blows them away? How, in God’s name, could they have posed a threat to anyone? Really, now honestly, how much farther down do we have to descend before serious discussion is focused on addressing our fundamental differences. What’s at the base of all this? Fear? Anger? Resentment? If so, then we need to start a dialogue about it. Find solutions. Maybe a summit of sorts; leaders, representing each of the communities, coming together to try to find common ground. Or, at the very least, a peace treaty. People on both sides want to be heard. Government officials see the necessity of brokering deals with other countries in conflict, why can’t they take care of our own? If our politicians can’t foster peace on our own streets, what good are they? First things first though, there needs to be a moratorium on violent reactions and behavior. How many churches have burned now? Decent, discerning people know that aberrant behavior doesn’t make us warriors, only criminals. Children rely on their parents and mentors to help them understand the difference between right and wrong. It’s a responsibility to instill a strong character in them, no matter how our personal prejudices may weigh us down. Teaching hatred is a crime. Children deserve the chance to seek peace in their lifetime. And it will never happen if we cannot come to a meeting of the minds. Some of the comments that have been reported in conjunction with the SC shooting are hard to fathom. And isn’t it a bit ironic that the liberty to make those types of inflammatory statements, (to which I will not extend their platform here,) the very privileges the KKK organization is exercising, the right to assemble & freedom of speech, (The Loyal White Knights of the Ku Klux Klan applied for a permit to hold a rally on the grounds of the South Carolina Statehouse, in support of the Confederate flag and, by their comments, Mr. Roof,) that that freedom is continually secured by some of the very people they are railing against. I guess it’s okay if they take a bullet to keep our country free, they just shouldn’t live here, is that it? Forgive me, I seem to have a lot of questions this time around. That most unpleasant topic leads me to one that is quite the opposite. (I promise, my jumping about will eventually make sense.) I’ve recently discovered a new website that has my full attention. Going to have to limit the amount of time I spend on it, I’m not getting anything done. tondo is a community of artists, art enthusiasts and anyone who cares to plug in; people who post, follow and engage in conversation about works of art. Art, in all its many and glorious forms. The reason I bring this up, I read an interesting post on their site, celebrating the 4th of July. The founders have impressive credentials in the world of art and their administrative posts and promotions are always engaging. To wish America a happy birthday, the tondo team posted their five top picks for the most iconic American works of art. In my opinion, one of the single most powerful agents for healing in our world is art. It’s good medicine to immerse ourselves in it. Artistic expression shares our deepest and most fundamental beliefs in a constructive way. 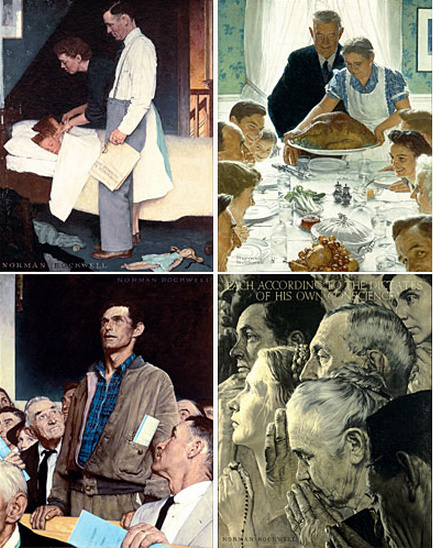 Norman Rockwell, (a favorite,) might have agreed, he was number 4 on their list; the subject, his series of paintings, The Four Freedoms. (Pictured above.) Each of the paintings depicts a different “American right,” Freedom of Speech, Freedom of Worship, Freedom from Want, and Freedom from Fear. The last two were his interpretation, but astute ones, no question. Fortunately, our freedoms have been defended without hesitation. Have those lives meant so little that we dishonor their service by waging war on our own streets? Among our own people? Generations that have worked hard to grow where they were planted, whether it was their choice or not; people on both sides of the fence. Circling back to that opening mindset. No matter how cataclysmic our divides, the one thing we can all agree on is the desire to live under Rockwell’s freedom from fear. We are the people. All of us combined, differences be damned. It’s in our hands to do something about it. Open dialogues, just do it. We may not like the idea but it’s become necessary. Mindsets must shift. The contempt of the arrogant and the derision of the proud will be our undoing. We must recognize who we are and come together regardless. Ready to listen. Just do it.